On the topic of religious liberty, much has been said recently (and remains steadily discussed) at the highest levels of government regarding Catholics and others with religious convictions who function in the public square, living openly according to the profoundly held tenets of their faith. I recently had the opportunity to interview Bob Marshall, an experienced former member of the Virginia House of Delegates, about this very topic: the Catholic faith and the public square. The transcript of the interview is below. (Please note that this piece does not constitute either an endorsement of, or opposition to, any political figure or party; rather, it is a reflective discussion with a prominent Catholic figure in line with the Church’s teachings regarding principles of faith.) I thank Mr. Marshall for his thought-provoking responses. 1.) Please tell us about your faith journey. I was first baptized Serbian Orthodox, in Pennsylvania. Then, I entered the Catholic Church at Saint John the Evangelist Church in Silver Spring, Maryland. I went to Catholic school from the first through the sixth grades, and then public school after that. I studied at Montgomery Junior College, the University of Maryland — College Park, and ended up going to Belmont Abbey College in North Carolina, graduating with a BA degree in history and philosophy. Later, I received an MA in humanities from California State University. I taught full-time at two Catholic schools: in 1968, English grammar for sixth to eighth grade students at St. Louis Elementary School in Clarksville, Maryland. There were students at St. Louis School who were direct descendants of slaves freed by the Carroll family and still living on land given to them by the Carrolls. In 1969, I taught American and European history at Ursuline Academy in Bethesda, Maryland, for tenth to twelfth grade girls. 2.) What role does your Catholic faith play in your daily life? My wife Cathy and I worked in the Diocese of Arlington, in the Family Life Office shortly after our marriage. I was encouraged to participate in politics by a number of people. Our faith has always been our foundation. We pray the Rosary. I dedicated my book to Our Lady of Guadalupe, the Patroness of the Americas. I worked for three members of Congress (from both parties) who were Catholic and who supported restoring complete legal protection for the right to life of children from conception to birth. 3.) What is it like to be a Catholic politician in the twenty-first century? 4.) At this junction in history, how can Catholics bring their faith into the public square? They should exercise their faith, or they will be chased out of the public square. 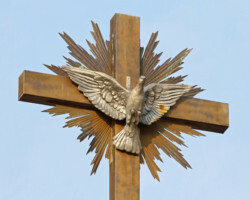 The efforts on the other side are aimed at putting Christians in the United States in the same position as Christians under Joseph Stalin in Russia and Eastern Europe, or under Mao Tse-tung in Communist China after 1949, or Catholics in Mexico under Plutarco Calles during the Cristero War. In those countries during those times, one could not be a Catholic teacher in government-supported schools, because you had to toe the [Communist] Party line. Professions such as law, medicine, and politics were cut off from believers. You had to choose between your pocketbook and your faith. Many secularists opposed to the faith want to do that now in America. Let me give you two examples with two recent Supreme Court cases. Masterpiece Cakeshop v. Colorado Civil Rights Commission was only won because of a technicality — because there was severe bias exhibited by the complainants from the state of Colorado against baker Jack Phillips of the Masterpiece Cakeshop. When it comes to marriage, figures like Saint Mother Teresa of Calcutta, let alone Jesus Christ himself, would be described as “hateful” based on their views of marriage. Also, NIFLA v. Becerra was only barely won, even though it was common sense to not require a pro-life center to refer for abortion. When our opponents talk about “tolerance,” they are not really talking about real “tolerance”; they want it to be a one-way street. There is a purging process going on, and the goal is to push faithful Catholics out of the public square, primarily by deeming them “bigots.” Catholics are being put in positions that either jeopardize their jobs or jeopardize their faith. Archbishop Chaput of the Archdiocese of Philadelphia has referenced in two recent books that this is not the America in which our parents grew up. The Archbishop reminds us that Christ said we are to be the leaven of society, the light of the world, and the salt of the earth. The secular state is looking to marginalize and replace us. 5.) What can faith do for us that politics alone cannot do? Faith can sustain us when we are facing odds that are seemingly insurmountable. Jesus said “Render to Caesar what is Caesar’s, and to God what is God’s” (Matthew 22:21). To render to Caesar, we have to know who Caesar is, how Caesar actually operates, what rules he is supposed to observe, and how we can effectively participate in the public square and still keep our faith. 6.) I usually ask this of my interviewees: what is your favorite scriptural passage, and why? 7.) Do you have any closing advice for our readers? People have asked me why I wrote the book Reclaiming the Republic: How Christians and Other Conservatives Can Win Back America (TAN Books/Saint Benedict Press, 2018). I would encourage readers to look at what I have written about religious liberty. When you have civic knowledge, you are better able to reverse the present course of the secular state in America. When it comes to society, or your status as a citizen, you cannot delegate this responsibility to other people. I put this book together so that those with religious convictions can rely on the natural law, as the Founders did. And natural law is not just for Catholics. There was only one Catholic signer of the Declaration of Independence, Charles Carroll, yet the Declaration is fully based upon natural law. Reclaiming the Republic corrects misconceptions about Thomas Jefferson’s so-called “Wall of Separation” between church and state, which is often used to paralyze Catholics into inaction in the public square. In 1803, Jefferson supported the Treaty between the United States and the Kaskaskia Native American tribe in Illinois which stipulated that Congress would pay $100 per year for seven years to a Catholic priest for training of Native American children in the rudiments of literature and for his duties as a priest, and $300 in federal tax money to construct a Catholic church building. The Founders refer to God four times in the Declaration of Independence: as lawmaker via the “laws of nature and nature’s God,” creator of mankind and giver of rights, supreme judge of the world, measuring men’s intentions, and protector through divine providence.